If you want to fly directly to Cyprus cutting out the stop over in Turkey you can do so by flying into Southern Cyprus. This is done by flying to Larnaca Airport. 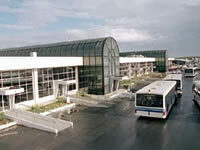 Larnaca airport is located in the south of Cyprus and from most European countries it involves a direct flight. There are over 20 different airways that serve Larnaca airport. If you are from the EU you won’t need a visa to visit northern or southern Cyprus. If you have already booked your hire car we will arrange a taxi transfer for all out clients for £35.00 GBP to take you to your collection point. Due to political reasons we are not able to provide car hire in the south of Cyprus. Listed below you will find directions from Larnaca Airport to Kyrenia in North Cyprus. Road maps won’t always show you the easiest route so we have listed it here. The route that we provide you with will help you to avoid the busy border crossing which is located in the heart of Nicosia. When you reach the main exit at Larnaca airport you will come to a roundabout. Here you need to take the left exit which is sign posted Lefkosia (59km). Keep going until you come to the next roundabout and continue straight through still heading for Lefkosia. Next you will come to a large roundabout with an overpass; here you will take the right exit to Lefkosia which will say 56km. You will now be on the main A3 dual carriageway. The next turn you will take will be a left that is signposted Larnaka and Leftkosia on the A2. Continue until you come to a roundabout where you will take the left lane towards Lefkosia. Continue along the A2 towards Lefkosia. This road will then merge with the A1. You need to continue on this road. After about 44km into your drive you will see a football stadium on your left. You will also see signs for Troodos, Stovolos, and Keryneia. From here you need to take junction 3 which is for the B22/A9. When you come to the roundabout you need to take the left filter lane which is signposted Keryneia (38km). Keep going and go straight through the traffic lights which are situated beside a shopping centre and follow the signs for Lakatameia and Troodos. You will come to another set of traffic lights and then a roundabout where you need to continue straight heading for Lakatameia and Troodos. When you come to the roundabout that also has a metro store, continue straight heading for Keryneia and Troodos. When you come to the next roundabout go straight heading for Makedonitissa and Keryneia. You will then come to a T junction on the top of a hill. There will also be a church on your right hand side. You need to take the right towards Kioneli and Keryneia. When you come to the next roundabout keep going straight. You will come to the Coca Cola factory and you will need to turn left at the traffic lights. The signpost will be marked Kioneli and Keryneia. The border is now just ahead of you so you can take the slip road to the left and park up. You will need to get your papers stamped. Once you have passed through the border you will come to a roundabout, keep going straight. At the second roundabout you will need to take the left exit towards Girne, Kyrenia, Gonyali, Guzelyurt. Keep going straight until you come to the next roundabout. Here you will take the right exit. Keep going until you come to another roundabout. This roundabout will have large memorial statues beside it. Take the left exist towards Kyrenia/Girne. Follow this road through the mountains and you will find yourself in beautiful Kyrenia ready to relax and enjoy your North Cyprus holiday. Another thing to note is that you cannot bring property brochures from north Cyprus across the border, you may be detained and questioned for this.